Yesterday, Jessica Conrad, Community Manager with the RE-AMP Network and I shared some of our experience fostering leadership within RE-AMP and NEWHAB. 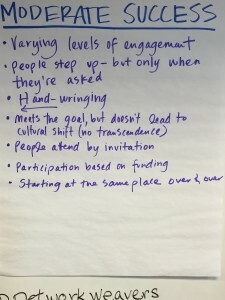 We facilitated a discussion with a group of Twin Cities network weavers about why emergent, shared leadership is so important for high-performing networks, what conditions foster self-organizing leadership, and how to begin creating those conditions. Has failed to create the conditions for informal leadership. Is moderately successful at creating the conditions for informal leadership. 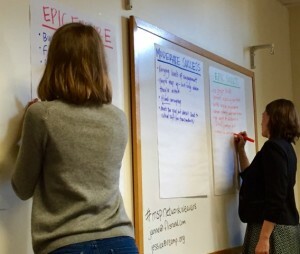 Is epic-ly successful at creating the conditions for self-organized leadership. 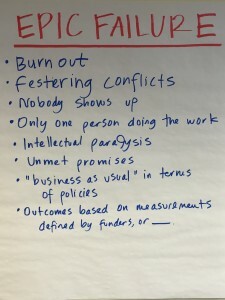 The failure descriptions started with burnout, festering conflicts, and nobody shows up. The epic success ended with momentum, new resources, inclusion, and sustainability. What conditions allow leadership to emerge in networks? 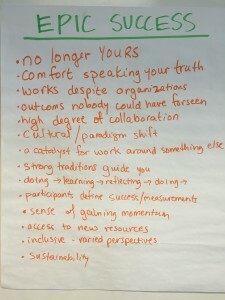 What can you do to activate leadership from where you sit in the network? Stay out of the way; let others make things happen — and embrace the discomfort when they do it differently than you would have. Words mean things, so choose language carefully. “Leadership” is both good and bad, and others may understand the word differently than you intend it. There is power in an invitation. What does that mean for who is (and isn’t) at the table? How do you balance out the power of the person inviting? As new leaders emerge, differing visions about where a network is going inevitably emerge. How do those visions get resolved? Can they be avoided? Posted on Wednesday, March 9, 2016 by Janne Flisrand. This entry was posted in Facilitation, Network Weaving. Bookmark the permalink. On vision, why not let go of the ONE vision and help everyone clarify their vision then engage people to share their visions, see how they overlap (or spread the network in new exciting directions) and how each others visions can challenge our assumptions. Then have people rewrite their visions after the discussion to see how visions can expand and grow. June, I agree that holding tight to ONE vision isn’t a very network-centric approach. While we didn’t explore that particular comment in the session, a future session may dig in on that and reflect on how to respond to that challenge. I suspect building a shared new vision will emerge if we do. Thanks for sharing, as always, Janne! Also happy to see you using the success spectrum! You and Jessica seem to have simplified it slightly in this context (failure, moderate, and epic vs failure, minimum, target, and epic). Could you share why you chose to do this and what was different about using it this way? It may seem subtle, but I’d love to hear more! Many thanks! I’m not sure why Jessica made that tweak, as she led this part of the session. It might have been a last-minute change given the limited wall space we had to work with, or it may be an intentional simplification based on something learned when using it with REAMP.